With the passage of the trough storms should fire up over the next couple of days. CAPE and LI values suggest a good possibility of storms however shear still looks a bit slack. Friday at this stage looks like it maybe the best for decent storms to get going. This is my first attempt at a forecast so feel free to add or correct me on anything I might have missed. And there is nothing wrong with your forecast - you did well! I think both today and tomorrow look quite nice actually - shear is actually not too bad slightly inland. Negatives are the cloud band not clearing in time but what else is new haha. We'll see what evolves! The next 4-5 days look pretty interesting with this upper low, however, there are some concerns. The upper low is forecast to become quite tightly packed and mobile. The problem with this is that the surface features will be somewhat left behind and the trough looks to consistently sit 100-150km ahead of the better shear. There should be plenty of instability, it really just depends if the shear comes to the party. If it does not, not only will there be slower moving storms, it will also mean the previous convection may not clear sufficiently to allow new convection to develop. This will be even more evident over the next 48-60hrs if the upper low moves west as forecast as it is going to leave cloud in its wake (to the east where the surface trough is). But on the optimistic side, if a few small things change (which often do in these closed low situation), the shear could push out from the low, clear the cloud and leave some nice, unstable, very nicely sheared storms. You are certainly correct about your concerns. I also am concerned about a weak cap meaning that numerous storms will develop on any of these days whilst the system remains 'tiled'. Today I chased the region near Tamworth and then with the quick information from Michael Bath I chased further north towards Manilla. 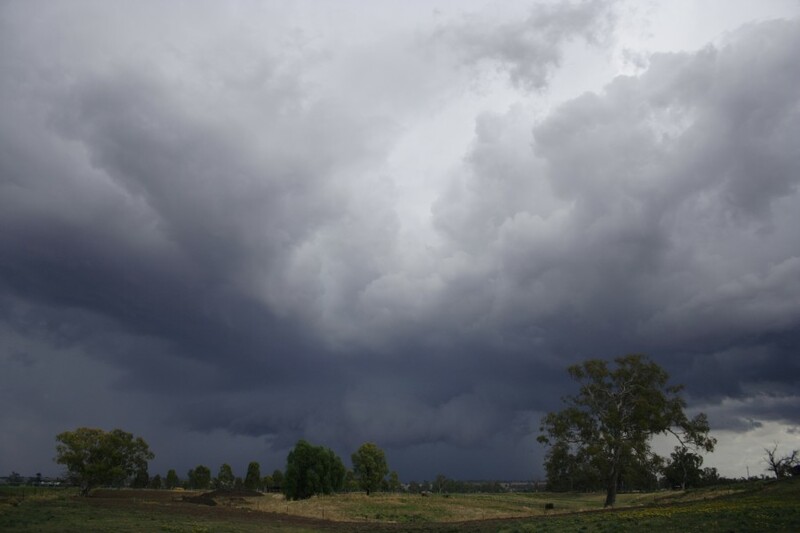 The first storm I intercepted just west of Tamworth was pretty with nice contrast. However, depsite earlier dynamics, it failed to become severe. I did detect the tiniest hailstones briefly more due to the cold temperatures operating and the surface was not excessively warm either (Tamworth is at an altitude of about 400 metres). The squall line associated with yesterday's cold front brought up to 25mm to the local area. Dew points were mostly up above 15 degrees today, which made a nice change for us. 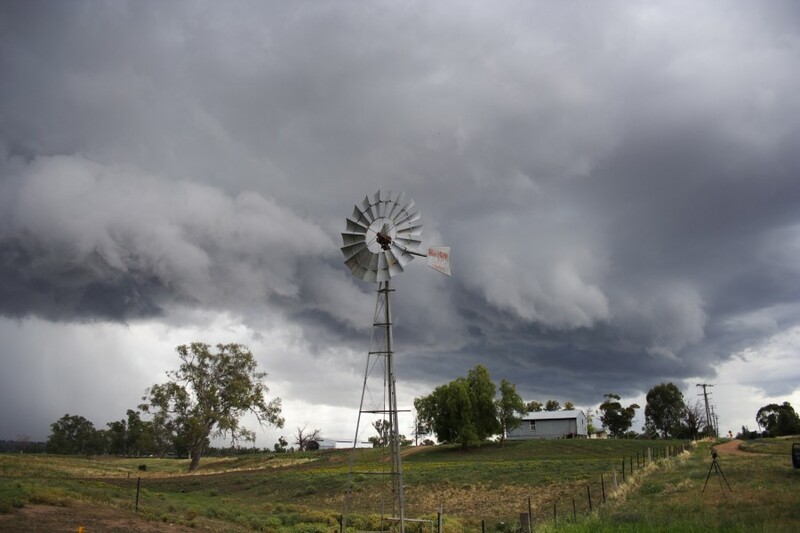 Despite relatively mild surface temperatures, good low-based convection set in around midday and a new line associated with the trough developed a little east of Walgett in longitude and extended a few hundred km in length. It was quite lightning active, the Vaisala lightning detector at work peaked at about 1050 strikes over 15min, within 56km range. 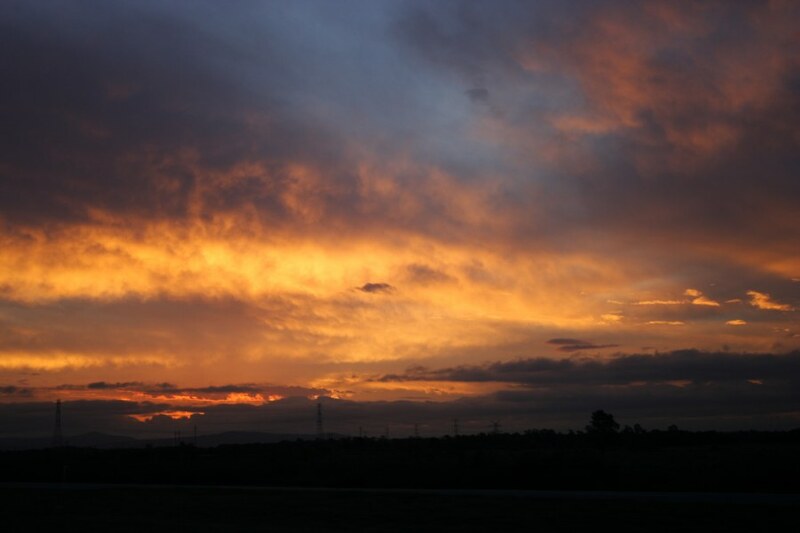 Mostly intra-cloud but there were some ripper CG's. 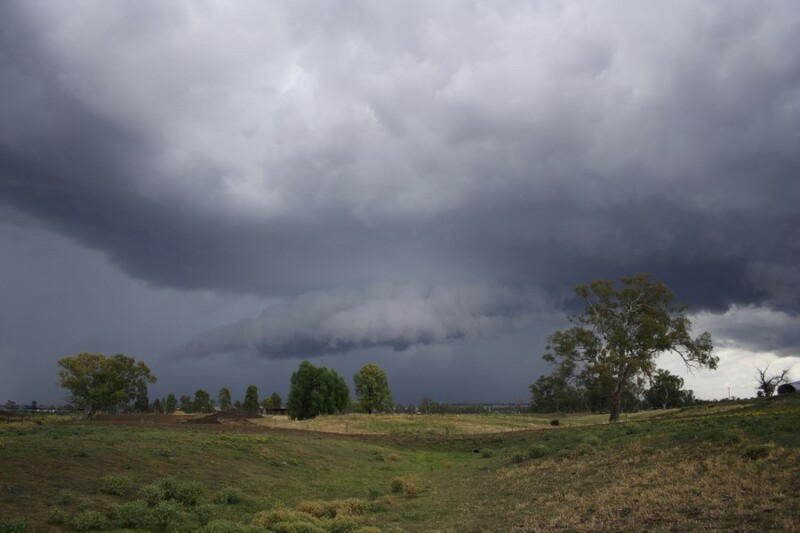 For a while there was a small shelf cloud which almost detached into a roll cloud for a short period. I didn't experience any hail but I heard reports of small hail in Wee Waa. At work we had 11mm in less than 30 minutes and peak winds of 50km/h. Not severe by any standards but I happened to have my camera today so here's a few snaps, there's even one with the antennas thrown in! The line was severe warned after it crossed Narrabri, but the warning was mostly for areas closer to Moree, and a different area parallel to the coast. Aviation forecast issued by the BoM this morning has some big BOMBs out west today for Area 40 (SE QLD extending out to the Darling Downs)...7000/45000ft. That is pretty tasty for SEQ. Interestingly enough, moisture laden soundings appear after 3z indicating convection/rain developing between 3z and 6z (I suspect closer to 3Z given lack of capping). I plotted a 3z sounding using 26/16 for 28S, 151.5E and came up with some drier air in the mid levels and some ok shear...10knt N'ly from sfc to 850mb, 15-20knt NW'ly at 700mb and 25knt NW'ly at 500mb (increasing to 35knts just above this level). Instability numbers came in with LI's of -4.5 and CAPE of about 1600jkg. Not too bad. I also like the look of the east-west aligned trough extending from the (surface) low centre along 31S (for the NSW guys...or SEQ guys feeling game). There will be some slightly different shear to play with here with much more of an easterly component in the lower levels and more N'ly in the upper levels...but with that E-W aligned boundary, it could get interesting. The biggest question is cloud. Will there be enough clearance to kick things off and will any clearer area just fill in with cloud? Some weak messy thunderstorm activity spread into the Northern Rivers during the afternoon. A cell producing some light rain at home surprisingly shot out a couple of close CGs - though I heard no other thunder apart from those two. In the early evening a stronger cell developed southwest of Mallanganee and encroached on the Casino area. Rodney and I went out for a look. Photography was difficult due to constant light rain but at least it was not windy. Managed to get a couple of nice shots just east of Casino. Another line of lightning active storms - which had started west of Moree earlier in the day - spread across the Northern Tablelands but died late evening. 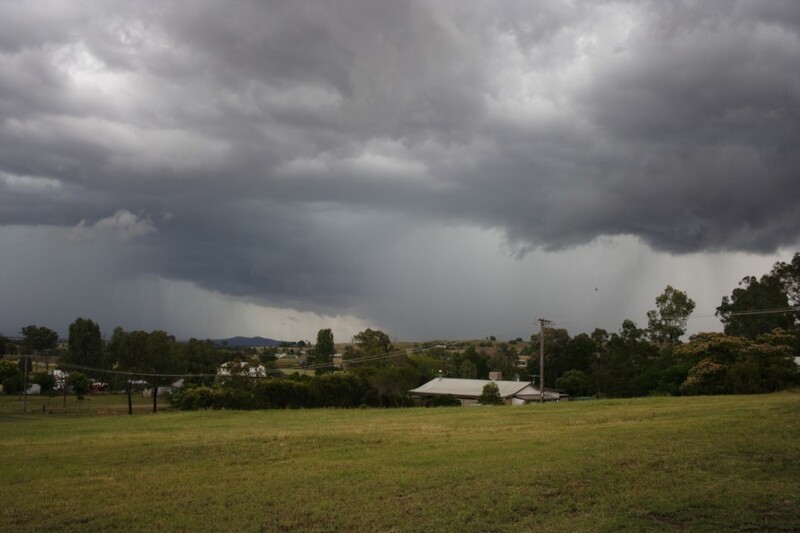 Hi all, adding from Mb's post the challenge of avoiding rain was given up on last night.Lots of cells around interspersed with leftover rainy mess from the northern tablelands.Nice to see the rain but preferably in Squall line set ups etc Here is a photo from last night!!! Having remained overnight in Inverell, I planned to remain in the area based on the forecast and possibly cross the border if required. But, from what I saw in terms of emerging patterns, I ended up calling it quits at 3pm and headed cautiously south. 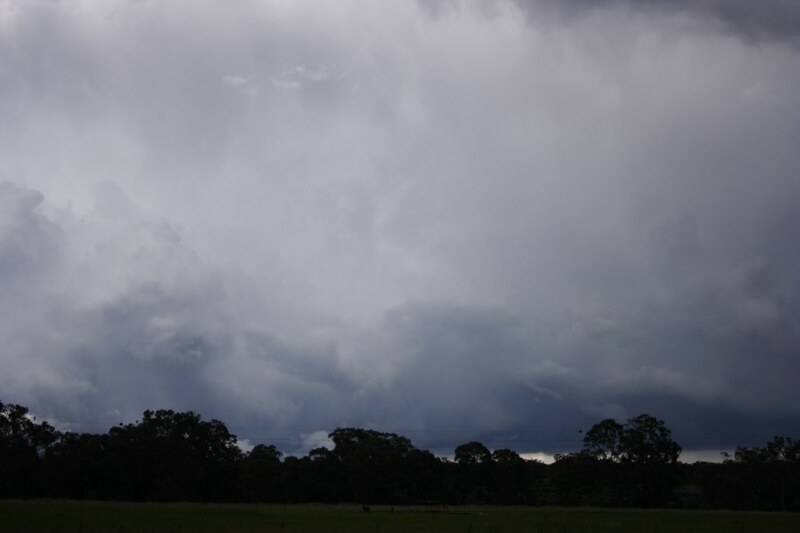 Well I watched this anvil from the storm that had developed rapidly near Inverell persist for long enough to keep delaying my trip back to Sydney. I got the impression it was weakening so continued on. The storms in most cases were rain producers. The cap was so weak on the day the storms never struggled to build. This cell seemed a little more isolated but the cool air left over from some of the previous storms would not have assisted. You know we complain when we have busts but in this case I seem to be compaining of too many storms:) I am sure the farmers are there with a smile. I am happy that this system will certainly give a good drenching for the inland.